White T-shirts are undoubtedly one of the most crucial pieces a person's wardrobe can contain. You can wear them with pretty much anything, and they suit all style types—but not all white T-shirts are created equal. Aside from a perfect fit, the number one thing we editors look for in a white tee is a fabric that's thick and tightly woven enough to not be see-through. Sure, a little sheerness might be okay for a fun night out, but if it's maximum wearability you're after, you probably want a T-shirt you can also feel comfortable wearing to the office or brunch with your parents. With that in mind, we're collectively divulging what our favorite non-see-though white T-shirts are, starting at just $6. The Who What Wear editors have a strong affinity for white T-shirts, and we've made it our individual missions to find the perfect ones after plenty of trial and error. Keep reading to find out what they are and why we're so loyal to them. "I love the Hanes x Karla Crew T-Shirt from celeb stylist Karla Welch. It's the perfect white tee as far as I'm concerned, and the $30 price tag definitely helps." "The perfect everyday tee. I wear this with everything from jeans to high-waisted trousers." "These are just thick enough to be completely opaque but thin enough to make for easy tucking." "These white tees from Double Trouble Gang are definitely my favorites. They are just the right thickness and come with an adorable little embroidery, which is always a great conversation starter." "I love Brandy Melville's 100% cotton white T-shirts not just because they're not see-through but also because they're affordable and have that perfect crew-neck shape and a length that can be either tucked in or left out depending on how you want to style them." "The nice, thick fabric of this boxy tee is the key to its opacity, meaning I never stress about what I wear underneath it. Just pair with high-waisted jeans and go." Also available here in sizes XS to L.
"I'm an Everlane loyalist. Comfy, great fit, and affordable, too." "I scored the below white shirt from Lululemon on clearance a few years back, and since then, it's become my go-to tee. From the perfectly relaxed fit to the slightly stretchy material, this, to me, is the best white tee out there." "They're a bit of a splurge, but based on how much I wear my white Re/Done tees (I'll admit I have a few), they're worth every single penny. They're flattering, soft, and not sheer in the least." "I've found most women's T-shirts to be thinner and therefore see-through, so instead, I started shopping in the men's department of Uniqlo to find the perfect standard crew-neck tee. I recommend sizing two sizes down for a fitted shape and one size down for a boxier fit." Available in men's sizes XXS to 3XL. 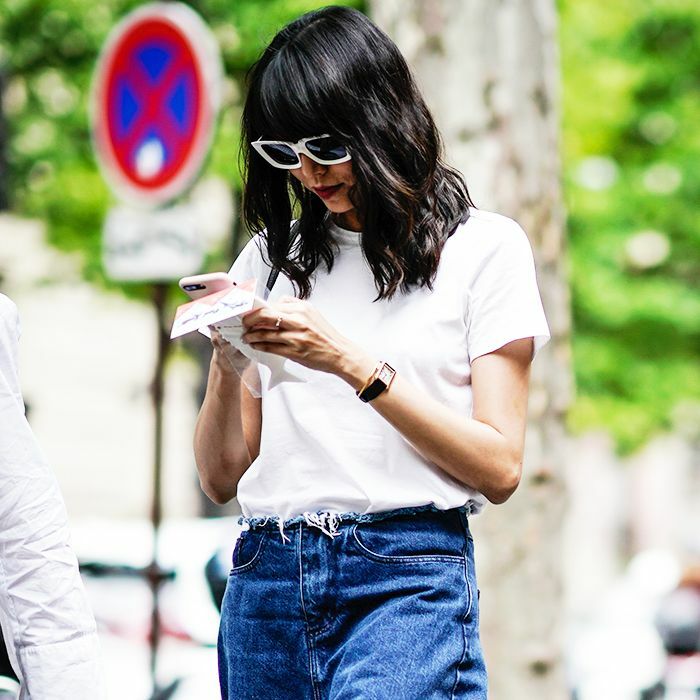 And now, here's how to style your basic T-shirt. The post was published at an earlier date and has been updated.